On February 14, 2010, celebrate Valentine's Day with "A Musical Feast". The 23-day Lecture on the Weather-John Cage in Buffalo showcase will conclude with an afternoon concert (2:00pm) by "A Musical Feast" at the new Burchfield Penney Auditorium. The program will include Bohuslav Martinu's Duo No. 2 for violin and cello, a sampling of Eric Satie's piano pieces, Jacob Druckman's Animus III for clarinet and tape, as well as a presentation of Shamayim, a film by Elliot Caplan and David Felder. This work is designed to exist in two complementary versions: the first, is a conventional live performance, with or without image, in concert halls with live amplification, processing, and 8 channels of sound; the second, a version for installation or home theater presentation in surround 5.1 and with a specially prepared image presentation. The latter was released October, 2009 by Albany Records (see previous post for more details). 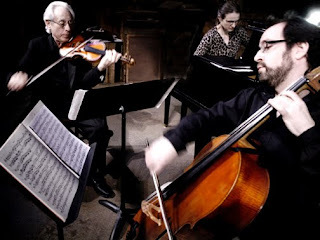 The "A Musical Feast" concert series is organized by former concert master of the Buffalo Philharmonic, Charles Haupt, and features established new music advocates like Claudia Hoca (piano), Jonathan Golove (cello), and Jean Kopperud (clarinet). "A Musical Feast" is co-sponsored by The Center for 21st Century Music. For more information, visit the Lecture on the Weather-John Cage in Buffalo and "A Musical Feast" websites.